Do not operate display functions during safety critical operations. Objects in the monitor are closer than they appear. The machineCam will not replace your eyes and ears. Please make sure that you are always monitoring critical operations directly. Leave at least a 2" / 5 cm space between the monitor and walls, cabinets or other objects to allow adequate air circulation around the device. 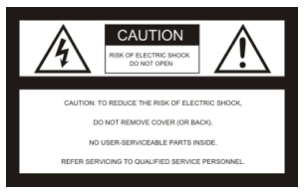 This symbol is intended to alert the user to the presence of uninsulated "dangerous voltage" within the product's enclosure that may be of sufficient magnitude to constitute risk of electric shock to persons. This symbol is intended to alert the user to the presence of important operating and maintenance (servicing) instructions in the literature accompanying the appliance.